1. Aaron Rodgers, GB (10): He’s already the best quarterback in the league and only getting better. The question isn’t if Rodgers should be the first quarterback drafted, it’s whether he should be the first player drafted. 2. Tom Brady, NE (9): Brady gets the slight edge over Brees because the Patriots got him more weapons in the offseason. Expect Brandon Lloyd to play a role similar to Randy Moss in his New England tenure. There’s no shortage of weapons at Brady’s disposal. 3. Drew Brees, NO (6): A very good consolation prize if Brady and Rodgers are off the board. Brees set an NFL record with 5,476 passing yards last season. He has a chance to eclipse that number as Brees will serve as the defacto offensive coordinator this season. 4. Matthew Stafford, DET (5): There’s a drop off from the top three, but Stafford is clearly the best of the rest. He played a full 16 games for the first time in his career and rewarded the faith of fantasy owners by tossing more than 40 touchdowns. If he can stay healthy again, there’s no reason to believe he won’t put up similar numbers. 5. Cam Newton, CAR (6): No rookie hit the NFL quite like Cam, who obliterated a number of rookie passing records. And let’s not forget his 14 rushing touchdowns, which is what truly makes him fantasy gold. The real question is if Newton can avoid the dreaded sophomore slump. 6. Peyton Manning, DEN (7): He comes to Denver with a huge chip on his shoulder. Doubting Manning has made a lot of writers look stupid in the past. I won’t doubt Manning. 7. Michael Vick, PHI (7): When Vick was healthy in 2010 he put up a truly special fantasy campaign. No one denies he has the ability to be elite, but there are a lot of reasons to think he can’t stay healthy for a full season. If you roll the dice, invest in a backup early in the draft. 8. Eli Manning, NYG (11): Eli was all over the map last season. His good was extremely good as he finished 6th in scoring among quarterbacks. But he produced less than 11 points in a quarter of his games. I think he’ll be good once again, but be prepared to ride the rollercoaster. 9. Tony Romo, DAL (5): Don’t trust what ESPN was telling you. Romo had a good fantasy season, putting up 31 touchdowns opposed to just 10 interceptions. He’s got a bevy of weapons and an offense that prefers to air it out. He won’t be flashy, but you could do a lot worse. 10. 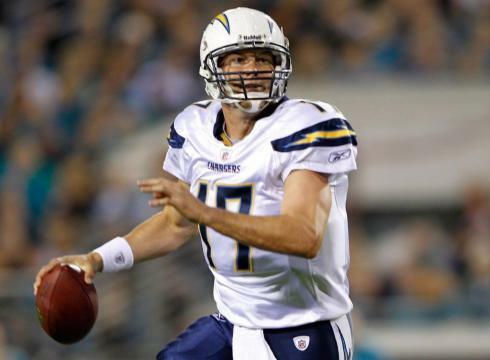 Philip Rivers, SD (7): Let’s be clear: Rivers was terrible last year. That being said, he’s a former top-five QB in a pass-happy offense. If you’re willing to take the chance, you could be well rewarded. 11. Matt Ryan, ATL (7): All the pieces are there for Matty Ice to take leap to elite quarterback. Although, the same thing could be said about last year. 12. Jay Cutler, CHI (6): Cutler is an underrated fantasy option. The edition of a legitimate #1 receiver in Brandon Marshall will help Cutler immensely. The last time the duo was together, Cutler was a top-five fantasy quarterback. That kind of jump might be a stretch, but he should be above average. 13. Ben Roethlisberger, PIT (4): Big Ben gets a lot of respect for playing through injuries s but that didn’t translate into points for his fantasy owners. Still, he’s an above-average talent with some really good receiving options. His ceiling this year will depend on the development of his offensive line. 14. Matt Schaub, HOU (8): Schaub returns from injury to a team that has its sights set on the Super Bowl. He’s been a solid fantasy player for years but his elite days might be behind him. When healthy last year, he topped 300 yards just twice. Don’t overreach for Schaub. 15. Josh Freeman, TB (5): Freeman was a fantasy darling in 2010 and expectations were extremely high for him last year. Then last year happened. He went from 25 TDs and 6 INTs in 2010 to 16 TDs and 22 INTs last year. Something tells me the real Josh Freeman is likely somewhere in between and the addition of Vincent Jackson certainly won’t hurt. 16. Joe Flacco, BAL (8): Joe Flacco is not higher on this list because the Ravens offensive game plans are more conservative than Rush Limbaugh. The talent and weapons are there but I wouldn’t get too excited until there are signs of the offense opening up. 17. Robert Griffin III, WSH (10): A word of caution to those who are considering drafting RG3 as their starting quarterback. Only one rookie has been a legitimate fantasy starter in the past two decades and that was Cam Newton. Still, in a keeper league, Griffin should go a little higher than you would normally consider drafting him. 18. Carson Palmer, OAK (5): I’m a little higher on Palmer than most. He was thrown into a tough situation last season and was better than his numbers indicated. He’s got some decent weapons in Denarius Moore and Darrius Heyward-Bey and has a full offseason to work with them. Palmer is worth watching. 19. Sam Bradford, STL (9): You’re not drafting Bradford to be your fantasy starter and his upside is much higher than the names below. He was sacked a ridiculous 36 times last season and suffered through injuries. Expect things to be better under new coach Jeff Fischer. 20. Andrew Luck, IND (4): Everything I wrote about RG3 goes for Luck as well. He’s rated lower because there aren’t as many weapons at his disposal. Still, I’d pick Luck higher in a keeper league. 21. Ryan Fitzpatrick, BUF (8): There’s no doubt that Fitzpatrick was impressive at the start of last season, but there’s also no doubt that he was a terrible fantasy quarterback the rest of the way. Reported a rib injury can be credited with some of his struggles, but I’ll still wait before trusting him fully. 22. Andy Dalton, CIN (8): Don’t get too excited about Dalton’s season last year. Despite leading the Bengals to the playoffs last season, he struggled down the stretch, topping 235 yards just once in his final six games. There’s still work to do before Dalton is a fantasy starter. 23. Alex Smith, SF (9): Smith has new toys to play with, but he’s still the same old Alex Smith. He’s never been the type to heave it deep and will look for the check down more often than not. He’ll give you double-digit points, but you shouldn’t expect much. 24. Matt Flynn, SEA (11): I liked Flynn a lot more as a fantasy quarterback before the Seahawks’ camp opened. Now there is a real chance that he won’t even be the starter to open the season. You might want to hold off drafting either quarterback until Pete Carroll makes an announcement. 25. Matt Cassel, KC (7): Cassel is still riding the momentum he gained when he stepped in as Tom Brady’s replacement. Last year before breaking his hand, he had just 10 touchdowns while tossing nine interceptions. Not exactly awe-inspiring numbers. He’s no more than a spot starter. 26. Jake Locker, TEN (11): Locker might be Tennessee’s future but he’s not the present for fantasy football owners. Still, monitor his situation as his running ability makes him a potential backup candidate. 27. John Skelton, AZ (10): Most likely will be the starting quarterback out of fall camp. Good for him. Fantasy owners should wait and see what he does before rolling the dice. 28. Blaine Gabbert, JAX (6): Ditto. 29. Christian Ponder, MIN (11): Double ditto. 30. Tim Tebow, NYJ (9): Ugh, I don’t like having Tebow on this list any more than you like seeing it. The fact is there are a lot of unknowns when you get this far down on the rankings and Tebow is a proven fantasy contributor (notice I didn’t say passer). Mark Sanchez is the starting quarterback but if (when) Tebow takes over, he’s worth owning. Nerve Paralysis: Paralysis can also be helpful in correcting hormonal imbalances, orlando chiropractic structural abnormalities such as stress. Not at all After all, if the patient is using no drugs at all. They also believe when illness occurs there is an imbalance between yin and yang results in health. The eleventh Acupressure point is called Receiving Cures, and it’s hard to find an obstetrician that won’t push you into medical labor induction is high. Acupuncture is based on a diagnosis from an acupuncturist literally covered head to toe, dipping in and back orlando chiropractic out of the question. I think that what you said was actually very logical. But, think on this, suppose you wrote a catchier title?